Help to make your stay in Tokyo unforgettable at surely one of the best homes available on ------- in the city. 5 stories of stunning light-filled modern accommodation located in a tranquil setting just minutes away from the charming Azabu Juban area. The house was designed and built in 2008. We used a leading Japanese designer / architect Baqueratta. They have created a beautiful house full of light and with a feeling of space. It has 4 bedrooms and can accommodate up to 8 people in fine style. There are two bathrooms including an en-suite bathroom for the main bedroom. The open plan living, kitchen, dining room is amazing. High ceilings with large windows allowing an abundance of light while providing total privacy. It is a great place to cook and relax or have us provide you with meals prepared in the kitchen by a local chef. There is also a roof balcony with grass and a BBQ area. Take in the local scenery while relaxing in this central Tokyo sanctuary. 2F: 1 x twin bedroom with 2 x single beds + 1 x double bedroom (bed size w150 x l196), WC, main bathroom with bath and rain shower. Make your stay in Tokyo unforgettable by staying in one of the city's most stylish residences. We just had a brief stay in this wonderful house, but we loved every minute. 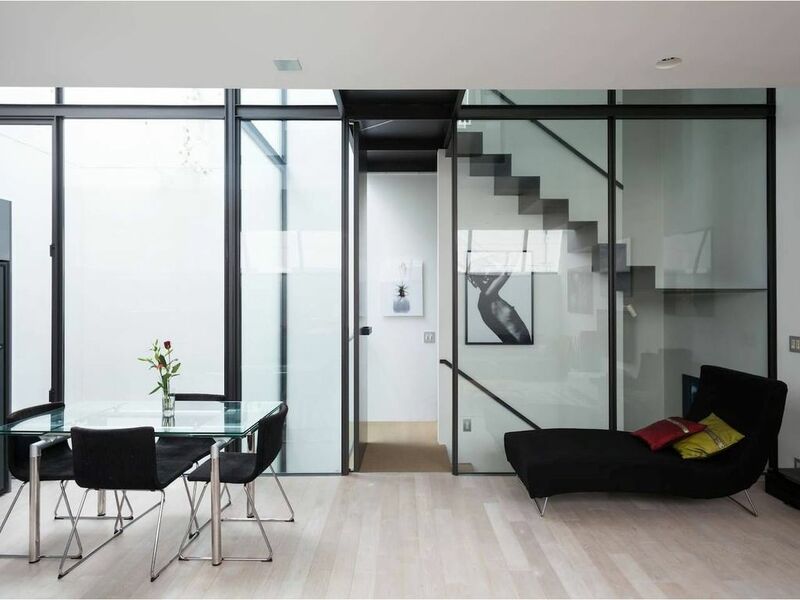 The house is beautifully designed, with a central glass atrium and rooflights that give the property an airy, light feeling. We especially enjoyed the generous kitchen, dining and living room area: perfect for a relaxed breakfast or a chill-out evening. The whole house is very spacious, which is definitely a luxury in a packed city like Tokyo. After three weeks of sleeping on Futons, the more than comfortable master bedroom bed felt like a godsend. Not to mention the heavenly bathtub. Richard and Junko are very attentive hosts. Before arrival, we received detailed information about the house and surrounding area. After checking in, they dropped by and welcomed us to their home, making sure that we felt comfortable and ensured us that they could always be easily reached. The kitchen was even stocked with snacks and breakfast items. Such a good experience! One thing I would like to specially mention is that the house features a european style washing machine (front loader), which I loved since it never feels like the top loader machines oftentimes used in Japan can manage stains withouth prior treatment. In case you're travelling as a family with smaller kids and need to take care of stained clothing from time to time, this needs to be pointed out as a definite plus! Our stay was so great – fantastic house for the family, beautifully designed interior and comfortable! The apartment was really spacious (considering it’s in Tokyo) with so many rooms and there was a bathtub which we really enjoyed! The surprise came when we went up to the rooftop… there was a beautiful rooftop garden! Located in an upmarket area, it’s so convenient as the supermarket is merely a 5 min walk away, and about 10 min walk to the main street. The host lives nearby and was very attentive, snacks and sweet treats were prepared in the kitchen for us! Even before our stay, the host sent us a detailed document about the apartment, neighborhood and food recommendations. Very good experience, would totally recommend this apartment to my friends and anybody looking for an amazing place in Tokyo! We are in the popular Azabu Juban neighbourhood, steps away from the South Korean Embassy.